Increase your range of motion on pulling moves to add width and taper to your lats. If you want to lift big, you have to learn to pull. And if you want a bigger back, you have to learn to pull with your lats. The only way to do that is to attack your back and beat it up by pulling longer, stronger and harder. If you’re not willing to work hard, isolate the wings and take every rep deep and controlled, your back will continue to lag behind, which is totally fine if you never plan on taking off your shirt in front of anyone. 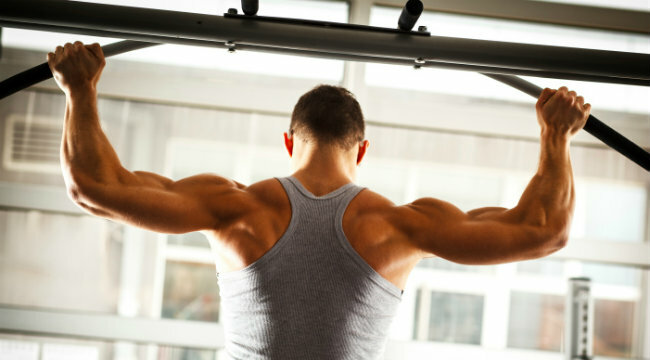 It’s pretty much impossible to truly isolate the lats and upper back, and due to their complex muscle fiber arrangement – the fibers run in several directions – pulling in one plane won’t build sufficient back size and strength. You’ll have to separate each movement and lift at every angle to help with symmetry and size. Most importantly, you may have to cut back on how much weight you use so that you perform your reps with a full range of motion (ROM) and only use your helper muscles on the last few reps of each set; otherwise, you’ll never build a solid foundation. With back training, elbow position is crucial. If you flare your elbows out, you’ll activate more of your upper lats, traps and rhomboid muscles. If you drop your elbows in tight, you’ll see your lats grow in length, as this position tends to work the lower portion of the muscles. Regarding ROM, don’t sell yourself short by failing to get your chin over the bar on pull-ups or leaving space between your torso and the bar when doing rows. Additionally, if you keep your wrists pronated (palms facing away or down) you’ll reduce the work of the biceps, thereby maximizing lat involvement. The exercises in the workout plan below will hit the back from every angle and isolate the lats as much as possible to give you a more dramatic V-taper. Try this pair of workouts for the next four weeks to build both strength and size – in the long run, increased strength will help with size, and vice versa. It’s a win-win situation. *If you can’t complete the set with full ROM pull-ups, do assisted pull-ups or lat pulldowns (after reaching failure on unassisted pull-ups) to reach the target rep count. Over time, set a goal to complete all sets unassisted. **Perform with a 2-second positive and 4-second negative. †Do 1-2 drops sets on your last two sets.